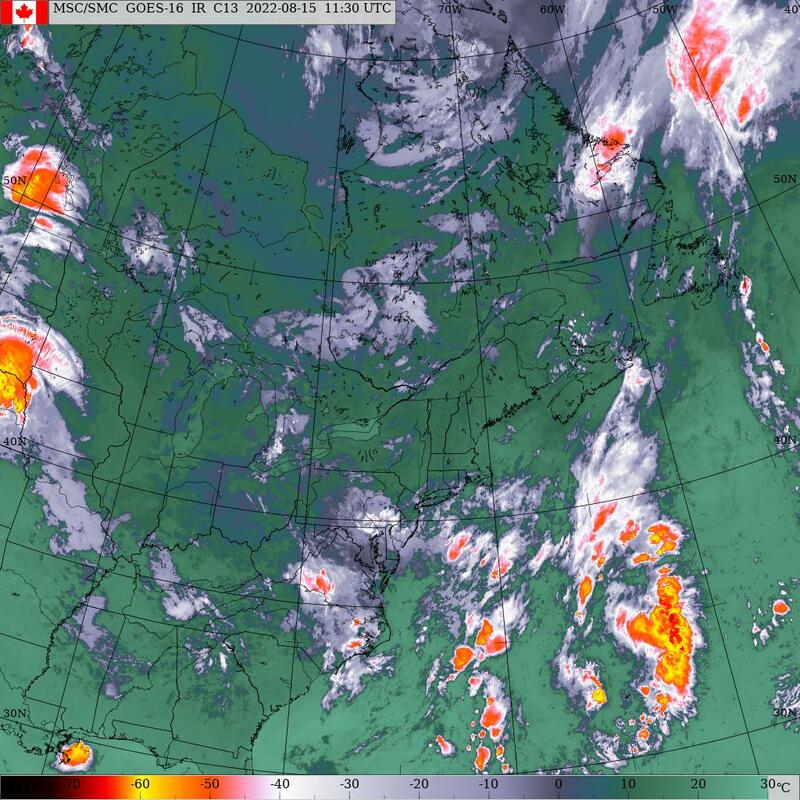 ← Turning warmer tonight/tomorrow across PEI..
Rain/wind/mild conditions expected today across PEI..
Saturday, October 20th 8:30am.. A low pressure system tracking across central Quebec this morning has spread cloud across the island with showers expected to develop later this morning. A strong cold front extending southward from this low will sweep across the island near mid morning tomorrow. Brisk-strong SW winds will also develop this morning ahead of the approaching cold front which will allow temps to climb well above normal. As mentioned, the cold front will cross the island tomorrow morning, resulting in a wind shift to the NW, cooler temps invade.. The front will stall just offshore NS tomorrow afternoon. Low pressure will develop along the stalled front and track NE east of NS into Newfoundland. This will set the stage for a significant rain event for eastern NS, Cape Breton and Newfoundland over the next couple days. The front then finally starts to move Sunday night allowing for much cooler temps to spread across the island for Monday setting the stage for some onshore flurries especially for down east areas. Very similar to yesterdays snow squalls. Ridge of high pressure swings across the Maritimes Monday night into early Tuesday morning allowing for a windshift back to the SW and warmer temps. Things then get a little interesting.. A small tight compact low pressure system will develop in the Gulf of Maine Tuesday afternoon spreading cloud and rain across the island. This new low will then intensify and track NE into the Bay of Fundy Tuesday evening then curve northward into northern NB or western PEI by Wednesday morning. This low then track northward through the Gulf towards Labrador Wednesday night into Thursday. Cold air will flood in behind this system with onshore clouds and flurries expected for both Thursday and Friday. A ridge of high pressure expected to dominate the weekend with sunshine. Precipitation.. Showers begin today near noon becoming periods of rain this evening and ending just after midnight. The rain may linger down east as they will be closer to the NS system. Rainfall amounts today/tonight will var from 5-10 mms across Prince and Queens to as much as 15 for extreme eastern PEI. Sunday should be dry although could be a shower down east. Showers/flurries expected for Monday. Rain develops Tuesday afternoon tapering to showers Wednesday morning which change to flurries later on Wednesday. These flurries will then continue through Thursday and Friday. Wind.. Brisk-strong south winds develop today peaking this afternoon then diminishing tonight. Light NW winds tomorrow, brisk west winds on Monday, brisk-strong SE winds, on Tuesday. Hazards.. Wet driving conditions in rain beginning this afternoon. Brisk SW winds may cause bridge restrictions this afternoon. Another rain/wind event possible Tuesday evening/night.